John Derstine Souder (1865-1942) was raised on a Mennonite farm near Telford in Montgomery County, Pennsylvania. He was a storekeeper, postmaster, and poultry dealer before retiring. 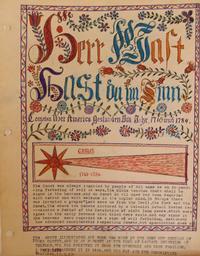 Souder spent the final five years of his life copying original Fraktur loaned to him by his neighbors and friends, and/or found in museums, as well as from printed sources such as Henry Stauffer Borneman’s 1937 Pennsylvania German Illuminated Manuscripts. The more he copied, the more skilled he became at rendering the Fraktur decorative elements found in Vorschriften (Writing Samples), Belohnungen (Rewards of Merit), Bücherzeichen (Bookplates), Geburts- und Taufscheine (Birth and Baptismal Certificates), Haussegen (House Blessing), religiöser Text (religious text), etc. 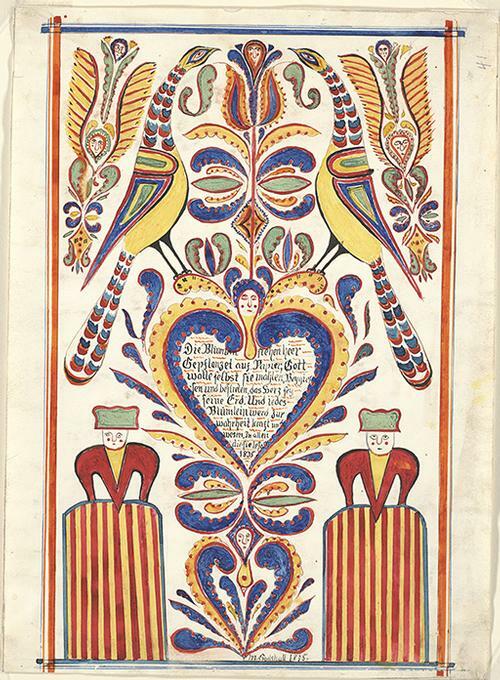 from the hands and fertile imaginations of some of the finest Fraktur decorators and scriveners known, as well as from the many as of yet anonymous contributors. 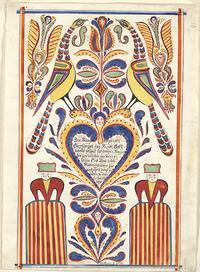 Copying other artists’ works, especially those of Martin and Samuel Gottschall, and then interpolating new versions of the imagery into his own pieces, Souder followed his instincts, producing vibrant colorful interpretations easily recognized today by his zany yet traditional approach to creating Fraktur. At his death his cumulative work was hardly recognized beyond his local area. 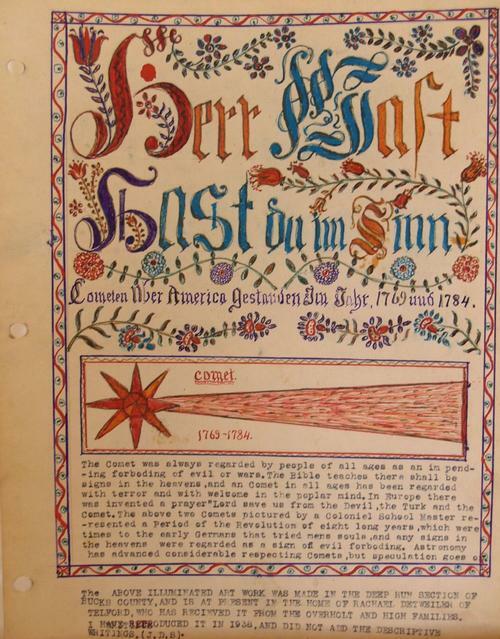 However, today’s museums and collectors value John Derstine Souder’s undertaking as a crowning touch to the Franconia Mennonite community’s well-known historical contribution to the flowering of Fraktur in southeastern Pennsylvania. Please be sure to visit our Facebook gallery for more images pertaining to Borneman Pennsylvania German Collection frk00105.